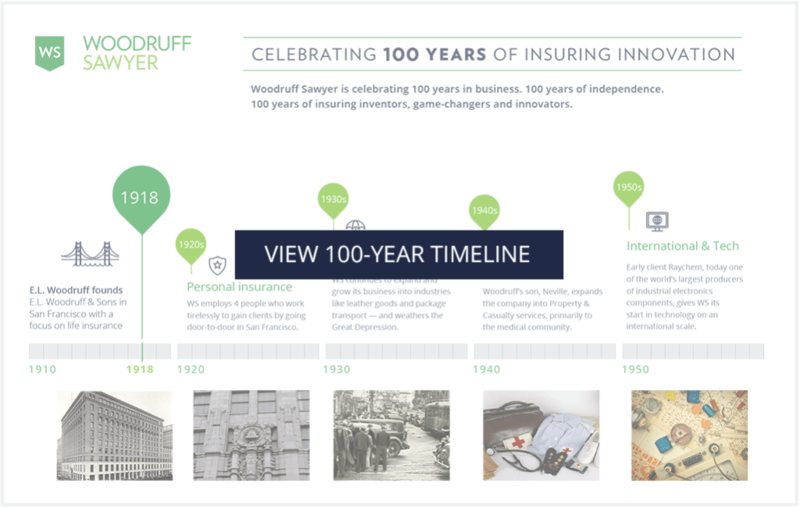 Woodruff Sawyer, one of the largest insurance brokerages in the US, is proud to be celebrating its 100th birthday. Founded in San Francisco in 1918, Woodruff Sawyer has been steadfast through a century of economic and political upheavals—World War II, globalization, economic upturns and downturns, and major tech advances—and has supported a myriad of clients who have molded the way we work and live. Through it all, the company has never wavered from its client-first approach, combining a deep understanding of clients’ businesses and risk needs with the expertise and clout to deliver market-leading results. In doing so, Woodruff Sawyer has helped clients navigate their ever-evolving strategic priorities as trusted, long-term risk advisors. Founded by Dr. E.L. Woodruff at the close of WWI, the company initially managed the risk needs of medical and healthcare companies and subsequently broadened its expertise to complex manufacturing, shipping, and other industrial areas. In the 1950s, Woodruff Sawyer began a long-term partnership with Raychem, an early electronics manufacturer, which marked the firm’s entry into the tech industry on an international scale. Past company leaders like Bob Sawyer and Doug Morton combined their passion for innovation, data-driven solutions, and deep specialization to address clients’ emerging risks. With a long list of visionary clients with unique risk needs, like Sequoia Capital, Netflix, and 23andMe, Woodruff Sawyer developed risk mitigation solutions, unique coverage terms, and consultative services where none had existed before. This ethos formed the basis for Woodruff Sawyer’s reputation as a complex risk specialist in areas such as D&O, property, products, cargo, and claims loss control. Woodruff Sawyer continued to invest in complex risk solutions and expertise, as well as in empirical data and a deep responsive service model, which continued to fuel the company’s growth in Northern California and across the US. Today, Woodruff Sawyer represents 28% of the Unicorns in California, across industries like social, healthcare and life sciences, greentech, big data, internet, and the on-demand economy. Over the past 50 years, Woodruff Sawyer has invested in developing expertise and solutions in a multitude of risk areas and industry sectors using its specialization and service model. Regardless of the risk area or industry, Woodruff Sawyer’s specialists are driven by a unique understanding of their clients’ needs, informed by data and supported by teams with a long track record of championing for their clients’ success.